Discussion in 'Effects, Pedals, Strings & Things' started by ALICE69, Jul 14, 2008. Can anyone here recomend a great Vibe pedal. I want the best,The very best. I know there's a bunch of threads on it, but what's another one gonna' hurt? My vote is the Effectrode Tube-Vibe... I won't ever need another vibe. YMMV, especially since these have not made the rounds much. Are you guys tryin' to pull somethin'. Based on some of your comments I bought the Roger Mayer unit...maybe not as authentic as the others, (keeps the original tone especially true just adds the phasing), but for my uses, I find this unit best for me. I've owned or played the Tube-Vibe, Mojo, Ultra II, Mofaux, Deja, Deja II, Ubervibe, Lovepedal Vibe and even the Rotovibe. The Voodoo Vibe+ allows control over the waveform that the others do not, which lets me dial in some very cool tones. I have some clips in my gear demo link below. I still plan to try the Aquvibe. Have the Roger Mayer Voodoo Vibe (older), Sweetsound Ultra Vibe (older), Fulltone Mini Deja vibe, Voodoo Lab Micro Vibe. I also have a Sweetsound Mojo Vibe on the way. I also have a Dunlop Rotovibe, but it doesn't sound like a 'univibe' as much as the others. whats the difference between a vibe and tremolo pedal? Vibe and trem couldn't be more different. Vibe is a crazy phasing modulation effect, and a trem varies and pulsates volume. Youtube the 2 so you can hear the difference. all the componets are the highest quality. I guess the tone is nothing short of amazing! Anybody tried these or have one? I really am curious about the Megavibe! The PE Vibe Unit is one of the best! Me too. I have original Uni-Vibe... I don't want to bring this to live shows.. anybody makes exactly like original? However, I do have an Aquavibe on the way so we shall see if the Ultravibe holds up. 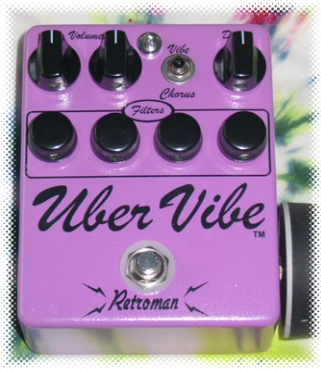 No other vibe pedal has been able to top the Ultra so far.